We’d love your help. Let us know what’s wrong with this preview of Tyrant's Blood by Fiona McIntosh. A decade has passed since the barbarian Loethar brutally conquered the last remaining, most powerful realm in the Denova Set--though the coveted Valisar Enchantment, the irresistible ability to coerce and control, eludes him still. Ten years since the warlord butchered the Set's royals and feasted on their blood. But he did not kill them all. To ask other readers questions about Tyrant's Blood, please sign up. With 10 years between the events of the 1st book and this one, not much has changed, and we spend alot of this book plodding about and catching up with the gossip of the past 10 years (which isn't much). The likability of the characters is way too interchangable between this book and the next/final book... During this book the personailities of the main characters pretty much agree with how the author laid them out in the 1st book... But then in the 3rd book (which is set over a shorter period of With 10 years between the events of the 1st book and this one, not much has changed, and we spend alot of this book plodding about and catching up with the gossip of the past 10 years (which isn't much). The likability of the characters is way too interchangable between this book and the next/final book... During this book the personailities of the main characters pretty much agree with how the author laid them out in the 1st book... But then in the 3rd book (which is set over a shorter period of time) their personality traits seem to change rather radically... The speed at which their personalities change doesn't seem very realistic (haha I know the genre is fantasy, but still, that doesn't mean the personalities of the characters themselves need to be unreal), although I guess it does make Book 3 more intersting as it mixes things up a bit more. Sometimes I forget just how much I love Fiona McIntosh's writing and storytelling till I pick up one of her books. Because it's unpredictable. And I don't just mean it always ends with a twist, no no no, it's a constant series of twists that I, at times, have to put the book and try to collect my thoughts while mentally freaking out because and --I CAN'T BELIEVE THAT JUST HAPPENED!-- but every 20-something pages. Her books can never be said to be dull, that's for sure. 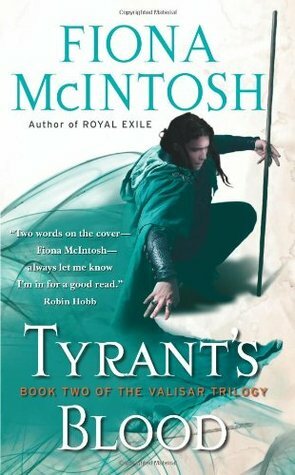 Her world building is rich, Sometimes I forget just how much I love Fiona McIntosh's writing and storytelling till I pick up one of her books. Because it's unpredictable. And I don't just mean it always ends with a twist, no no no, it's a constant series of twists that I, at times, have to put the book and try to collect my thoughts while mentally freaking out because and --I CAN'T BELIEVE THAT JUST HAPPENED!-- but every 20-something pages. Her books can never be said to be dull, that's for sure. This review has been written for The David Gemmell Legend Awards for Fantasy site (http://gemmellaward.com/). Haven't found any book yet by this author that I don't like. Beautiful writing, great characters and engrossing story. Wow, McIntosh really stepped her game up! So the story continues on 10 years down the line in this novel. Very exciting with loads of revelations about old characters. Loads of plot twists so it kept me on my toes. Some elements and coincidences, I didn’t believe in. Felt a little too easy and out there. But mostly, the story really developed. I’d have liked a little more character development and background into Leo though. Overall, I’m hooked to the series and I can’t wait to start the next book Wow, McIntosh really stepped her game up! Eh, Probably not going to bother with the third book. Definitely better than book #1 in the trilogy. I gave the first book three stars because although there were flaws they weren't bad enough to stop me enjoying the story overall and I hoped it would get better. This one is actually worse than the first and only just deserving of the two stars I have given it. I have already bought the third book, but at this stage I don't know whether or not I will bother with it. It's all the more annoying because of how promising the storyline is - it really is an interesting story, but there are just too m I gave the first book three stars because although there were flaws they weren't bad enough to stop me enjoying the story overall and I hoped it would get better. This one is actually worse than the first and only just deserving of the two stars I have given it. I have already bought the third book, but at this stage I don't know whether or not I will bother with it. It's all the more annoying because of how promising the storyline is - it really is an interesting story, but there are just too many little irritations that get in the way of my enjoyment. Here is a list of things that annoyed me. I have put some slight spoilers towards the bottom of the list so you can just read the first part if you want to avoid them. Major spoilers are tagged. 1) It starts with a chapter in a parallel universe (not really a spoiler because it is literally the opening of the book). I don't mind stories with parallel universes, but this one really annoyed me because there was no indication of it in the first book and I don't think you can introduce something so radical this far in to a story when it has never been mentioned previously. 2) Ten years have passed between the first and second books, but somehow very little has changed and the characters haven't really grown/matured/changed at all. Others change so wildly that they don't feel like the same character at all, and only vague, unsatisfactory reasons are given to explain what happened. 3) Some characters fall in and out of love almost instantly (this happens in the first book too) and make stupid decisions because of their 'love' for characters they have only known for a few days. Other characters spend over ten years remembering one person they loved ages ago and that they could never get over, which seems just as ridiculous. 5) There is a bit where a character actually says the words "[Character's name], we meet again". Unironically. Need I say more? 6) This is linked to point 2 - A character spends ten of his formative years - basically his teenage years - living with an outlaw band in a forest, but he somehow speaks and acts completely differently to the rest of the outlaws. 7) Following on from that, another character with memory loss spends TEN YEARS wondering who they really are, before eventually deciding to investigate. That's already pretty unbelievable, but on top of that the character is then very happy to believe what they are told about themselves and inexplicably pick up pretty much where they left off before the memory loss, with ALL their memories intact. Essentially their memory loss was just a convenient plot device to keep them away from the main action for a while, which is lazy and a bit lame. 8) Characters seem to be able to work out what other characters are thinking, or what their motivations are, from the tiniest of clues. "Oh here's a (view spoiler)[fire with a half-eaten hand (hide spoiler)] in it, that must mean so-and-so was here and did this thing which I happened to have heard about ages ago and which I suddenly remembered just now." I just don't buy it. 9) Characters who shouldn't really remember each other somehow do. (view spoiler)[Gavriel instantly recognizes the name Kirin Felt and knows exactly who he is, even though Kirin would have only been around in the castle at the same time as Gavriel for a few days, and Gav surely had other things on his mind. (hide spoiler)] A simple "hmm, where do I know that name from?" and a short explanation would have been much more believable. I was worried when I started reading this to be honest. It had been over a year since I read the fieat in the trilogy, and there was a curious message at the beginning almost apologising for the story, and that it was written without prior planning. But McIntosh is one of my favourite authors so I read one. And if I'm honest, that directionless style is quite clear in the plot - but surpised me by being interesting. At the end of book one, the position was clear. King Leo wanted his throne back from the invader. But by the end of this one I'm losing track of who the bad guys are, and I have no idea what's going to happen in book three. However, there are a couple of downfalls of the aimlessness I think. One character from the previous book doesn't appear until near the end of the book, and happens to chance upon an event, taking something which makes half the planning in the book seem a bit pointless. But for the most part I enjoyed the story. The characters are generally quite good, although they seem to blur their personalities a bit when McIntosh wants them to do something a little out of character. But the most interesting thing is that the main characters from the first book are kind of relegated to the back seat in this book, allowing others to take centre stage: particularly Pevin and Kirin. Finally, I want to discuss a couple of more technical issues with the writing style itself. For example Mcintosh quite often stops a scene at a pivotal moment in a scene, or even just after someone asks a question. I assume it's something to build tension - but it's something that should be used sparingly, but isn't. It quite quickly becomes annoying. Especially when the next scene with those characters doesn't resolve the cliffhanger immediately. For example, Pevin's adopted father asks a question that will change both of their lives. Then there is a scene break, and when we get back to Pevin, the question hasn't been asked yet, and isn't for another page or two. It's an unnecessary and overused technique. first of all i curse my childhood habit of makin sure to finish a novel no matter how boring or offencive i find it.. because this is the Most stupid piece of rubbish i have read in last couple of years. .
while the first part was enjoyable the 2nd nd 3rd part just shows the bankruptcy of the author.there is no coherency. .no logic no underling theme ..i mean a 5 year adorable retarded infant suddenly without any explanation becomes the 15 year main evil incarnate of the story and a barbarian who eats his enemy flesh becomes the hero and is being justified nd forced feeded to us to consider him such throughout 3rd part. .a major villain is left injured by d good side without any explantion to create more problems nd people makes starts making sudden illogical decisions against their past nature ..
i think fiona tries to makes a pathetic attemt to becomes first mark Lawrence nd shows pure gory in her villain. .than GRM nd like jamie lanister tries to redempt her villain than she tries to become sanderson coming of age hero plot . and in process becomes a miserable nothing. .
C2009. How disappointing... not going to worry about completing the trilogy, I am afraid. I must admit that the statement in the Acknowledgements ie " I was nervous about throwing readers into a contemporary world for the opening chapter but it felt right.." really, really put me off. Firstly, I really dislike paradigm shifts, separate planes etc etc. Then, if I had wanted contemporary, I would not choose a fantasy novel. After that, the story did not grip me in any way and sadly I had to admit C2009. How disappointing... not going to worry about completing the trilogy, I am afraid. I must admit that the statement in the Acknowledgements ie " I was nervous about throwing readers into a contemporary world for the opening chapter but it felt right.." really, really put me off. Firstly, I really dislike paradigm shifts, separate planes etc etc. Then, if I had wanted contemporary, I would not choose a fantasy novel. After that, the story did not grip me in any way and sadly I had to admit defeat and call it a day on this one. One of the few books where I just couldn't bear to read one word more. I can see lots of positive comments from Robin Hobb and although I love Hobb's books, I do not agree with her opinion on this one. Hey ho. ""As it turned out, revenge is always a cold satisfaction; it never quite lives up to the anticipation" "
I enjoyed the second book in Fiona McIntosh’s Valisar trilogy, more than I did the first book. This book was still a little bit too graphic for my taste, but I did enjoy reading it. This series, in general, is darker than what I would normally read so that may be impacting my view of it. I don’t want to put too much into my review because it has been hard for me to write anything that does not give the story away. I will say that the people and situations are not as cut and dry as you might think I enjoyed the second book in Fiona McIntosh’s Valisar trilogy, more than I did the first book. This book was still a little bit too graphic for my taste, but I did enjoy reading it. This series, in general, is darker than what I would normally read so that may be impacting my view of it. I don’t want to put too much into my review because it has been hard for me to write anything that does not give the story away. I will say that the people and situations are not as cut and dry as you might think in this series but shades of gray. I had a hard time putting this book down. I will be finishing this series and am thinking of taking a look at some of Ms. McIntosh’s other series. FTC Disclosure: I received a free copy of this book from the publisher. Second book in the Valisar trilogy and it was a disappointment. I should have known as the first volume wasn't great in spite of a good review. The second also got a good review, but it was possibly a worse book than the first. Badly written, badly edited, characters without any substance or just not believable, plot that had so many coincidences in it that it wasn't believable - need I go on? And it is quite long, so if you decide to read this, you have been warned. No, I did not go far. I should have trusted my instinct. After all, it took me 2 years to finish the first book. Thankful those come from the library. Why, in the L... name would you feel like it was necessary to have parallele universe and whatsnot. It's not a spoiler, it happens within the first few pages of the novel. J'ai trouvé que le deuxième livre de la trilogie était meilleur que le premier! L'action s'enchainait mieux et on arrivait à s'attacher aux personnages un peu mieux. J'ai bien aimé les révélations qui ont été faites au cours du livre et certains évènements innatendus étaient très bien pour redonner de l'intrigue à l'histoire. I devoured the second in the Valisar trilogy as quickly as the first. I've come to love the characters, although I'm still not quite sure what to expect from some. The last Valisar prince wants to avenge the slaughter of his family, but there are so many surprises and layers that you'll never guess where this adventure takes you! Has to go down as one of the most flip-floppiest books I've ever read. I wouldn't so much as call them plot twists, but I don't think I've ever had my feelings about a character (or ...nearly all of them) change in the space of 2-4 chapters. This book accomplished that and more. This book was brilliant! Everything was happening so fast but so slow at the same time because i just wanted to know MORE! Such a page-turner! As soon as i can get my hands on the third book i will be right into it! Well done Fiona Mcintosh! I am still enjoying this series, but there was a lot of darkness in this book. It was good, I just wish I had read it at a time when I didn't want a light book. I still can't wait to read he third in the trilogy. Read from 12/29 - 1/1. I can't figure out if I like this series or not. I'm still unsure as to whether or not to get the next book. Great storytelling as always from McIntosh. Excellent!!! Great continuation from the 1st book without any dry gaps. I really liked this book. i would have liked to see more of the modern world stuff in it, but oh well. there were a lot of editor errors/typos, but i still enjoyed it. Fiona writes best selling historical adventure-romance alongside the heroic-romantic, often brutal, fantasy she built her career upon. She lives in Australia but frequently roams the world meticulously researching the locations and gathering material for her historical novels that have international settings. Her books are published worldwide and in various languages. Her most recent historical fi Fiona writes best selling historical adventure-romance alongside the heroic-romantic, often brutal, fantasy she built her career upon. She lives in Australia but frequently roams the world meticulously researching the locations and gathering material for her historical novels that have international settings. Her books are published worldwide and in various languages. Her most recent historical fiction has gathered such a following that she is now hosting a tour in 2014 to Paris and Provence so eager readers can walk in the footsteps of her characters.